When summer break began, I knew I was going to have a little extra free time since we teachers get the summer to ourselves 🙂 It hit me that this was as good of an opportunity as I’d get to try and put my A-Rod collection back together. While it’s been a little spendy, it’s been a fun ride so far. I found my way to FreedomCardBoard thanks to Corockies, and ever since then my collection has taken a Huge step forward. One member suggested I make a wantlist so I decided to make a top 3 most wanted cards. It’s been a month since I made that list and I’ve been fortunate enough to purchase 2 out of the 3 cards on that original list! If you’ve read my Ionix breaks from this year, you remember that I mentioned that this HoloGrfx insert was my most wanted card, after selling the first one I ever had 4 years ago. They fall at 1:1500 packs which isn’t even one per case! I wonder how many were produced…my guess is 50 of each player but it may be as many as 100. A big shout out to gradedeflator on FreedomCardBoard for hooking me up. He originally posted it in the 90’s Insert Thread that has a huge following after I mentioned how nice his Piazza HoloGrFx was. We then cut a deal for it and it was waiting for me after my Alaska Cruise. Donruss has some wonderful looking inserts and they, along with Leaf, are knowing for their serial #d inserts in the 90’s. These also come in a non die-cut version which are #d to 1000. While this card is #d to 1000, the first 250 were die-cut versions. 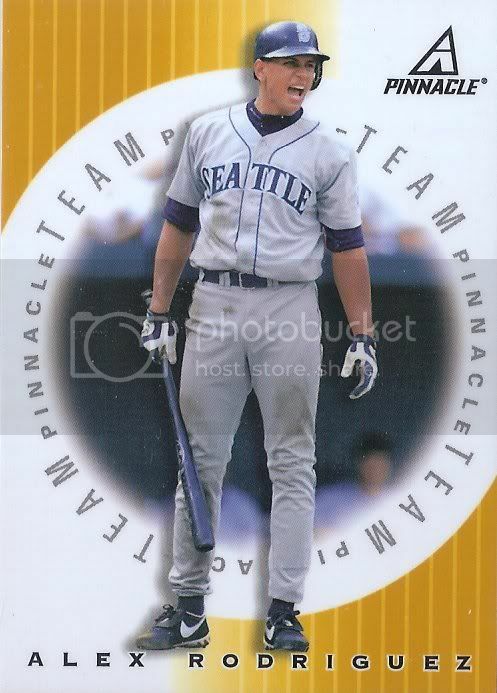 I remember seeing Magicpapa’s Griffey and thinking I had to find the A-Rod. Well 7 years later, I finally have one in my collection. A big thanks to George Kalfus at freedomcardboard for messaging me about this card. One just popped up on eBay and I knew it would cost a pretty penny or three for it. George messaged me the same day 🙂 I absolutely love it man, thank you!! I bet by now some of you are wondering what #3 was right? Well just to get it out there that I’m looking for it, it’s this card. The owner at the time was a user by the name of cubuffs13 who is on sportscardforum. I remember seeing this card for sale many years ago and passing on it. Let’s hope on shows up one of these days. Before I sign off for a few days I have a couple of things to look forward to in the future. First off, I have two 2000’s boxes coming in after I get back from my trip to Arizona. A box of 2000 Showcase, and 2000 Ovation. There’s a slim chance to find something spectacular but they should be fun breaks for me regardless. Secondly, I will be in Arizona and should have some time to swing by some card shops while I’m there and also pick up my 1996 and 1997 Fleer Metal sets my buddy has been holding onto for me. I’ll be sharing those and the story behind them next week. Until then, thanks for the read and thank you to everyone who keeps me excited about collecting still, especially all of you are FreedomCardBoard. Posted on July 29, 2016, in Maildays and tagged Alex Rodriguez, Donruss, HoloGrFX. Bookmark the permalink. Leave a comment.